Plan the wedding and honeymoon of a lifetime with Tropical Sky's dedicated wedding team for a unique wedding abroad. Whether you choose to get married on safari, arrive with an escorted elephant in Sri Lanka, indulge in a unique wedding where East meets West in Thailand or in the tropical Caribbean we will have a wedding ceremony that is just right for you. 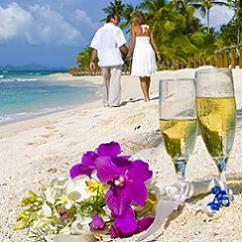 Late Wedding & Honeymoon deals to Barbados !